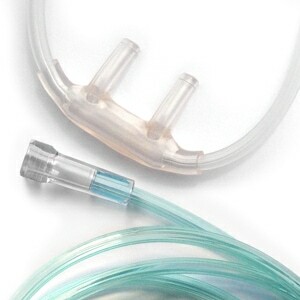 The clear, lightweight Salter 1600Q Cannula incorporates a unique one piece anatomical design that eliminates the need for irritating flaps. 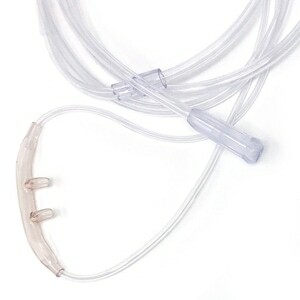 The 25-foot supply tube includes a three-channel, crush and kink-resistant design; while the over-the-ear style head set ensures secure positioning, allowing for more freedom of movement without worrying about shifts or oxygen loss. This tubing definitely helps getting a good night's sleep! As a light sleeper the noise from the regular tubing kept me awake. I just wish the length of tubing also came in 15 feet. Seven feet is too short, and 25 feet is too long for what I need. I only wear this tubing and not a CPAP mask. This tubing is comfortable and easy to adjust. I have no trouble sleeping with it on. 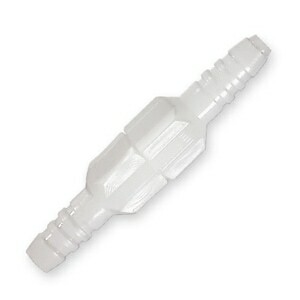 I ordered these cannulas from Direct Home Medical as they are my go to place for all my 02 tubing supplies. Their delivery is so fast & they are very easy to do business with. Great Company, Great Prices. I have been getting stuff from them since I found them a few years ago. Products are as advertised, good quality. I have a rather small nose anyway, but this cannula was extreme. The hose covered my top lip and pushed into the upper part of my nose. Very uncomfortable, waste of money and still having to be kept awake by this noisy cannula that does fit. SAD! My husband is on O2 24/7 and indoors he uses an oxygen concentrater. Having to use oxygen but not wanting to sit all day he will go from room to room but in doing so, a "normal" air hose will kink up and get twisted until it blocks the sir flow. With the Quiet nasal cannula with 25 foot tubing that just never happens any more!. His oxygen company refuses to purchase them even by the case saying he would be the only one using them. So until they see the light, I will purchase them on line for the very reasonable cost the Direct Home Medical. I enjoyed the purchase of this product. The cannula is soft and very flexible. In addition, pricing was quite competitive. Too long to be easily mobile. 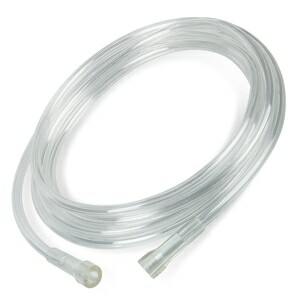 I thought a really long single tube with the cannula would be a good idea for more freedom moving about my house, but unfortunately 25 feet is too short to make it from center of house to both ends of house, and when I add the shortest tubing I bought...21 feet.. it becomes constantly tangled. My guess is I will be better off with a single 40 foot tubing and using a 7' cannula. Super quiet is correct though...that part is perfect fit and works great, but I've learned my lessen. It's easier to use more than one length tubing to gain the total length I want, because you cannot shorten the tubing that has the nasal cannula as part of it. Unfortunately I made this mistake with a couple of different extra long cannulas and in order to get a better price, I bought 5 of everything. Just goes to show I have a lot to learn. Excellent price for a quality product. Well packaged. Length of hose eliminates snarls and catches over distance. EXACTLY WHAT I NEEDED THE LENGTH ALLOWED ME TO POSITION MY PORTABLE OXY CONCENTRATOR OUT OF THE WAY AND FREEDOM TO MOVE AROUND.